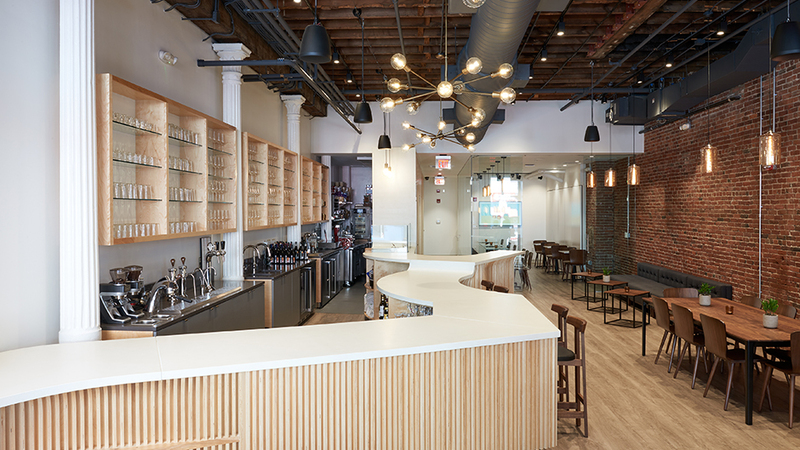 Joel Lamere, Assistant Professor at U-SoA, and partner Cynthia Gunadi of GLD Architecture (Gunadi Lamere Design) have been recognized by the Boston Society of Architects with a 2018 BSA Design Award in the Hospitality category for their project, Taste Wine Bar and Cafe. The primary design element in the project is a continuous millwork “ribbon” that unifies the long space from entry to back, organizing the space into seating and service zones that can operate together or separately. Plywood ribs are used throughout the project, as a simple element malleable enough to inscribe the ribbon's many functions; they form a guardrail, lounge bench, service counter, standing/educational counter, food display, and finally wall cladding for the back of house. The rib profiles are all custom, carving out shelving or knee space, with variable spacing to range from a flush surface to bottle storage shelves.